Now in its 10th year, the music festival A Day in the Country will feature two-time Grammy Award winner Jim Lauderdale along with an array of other artists, including Rex Hobart and the Misery Boys, Lint Trappers (feat. Tony Magee), The Lawrence Peters Outfit, The Hoyle Brothers and The Family Gold. The festival will take place at 2 p.m. June 25 at The Hideout, 1354 W. Wabansia Ave., Chicago. Tickets are $12, available at www.ticketfly.com. 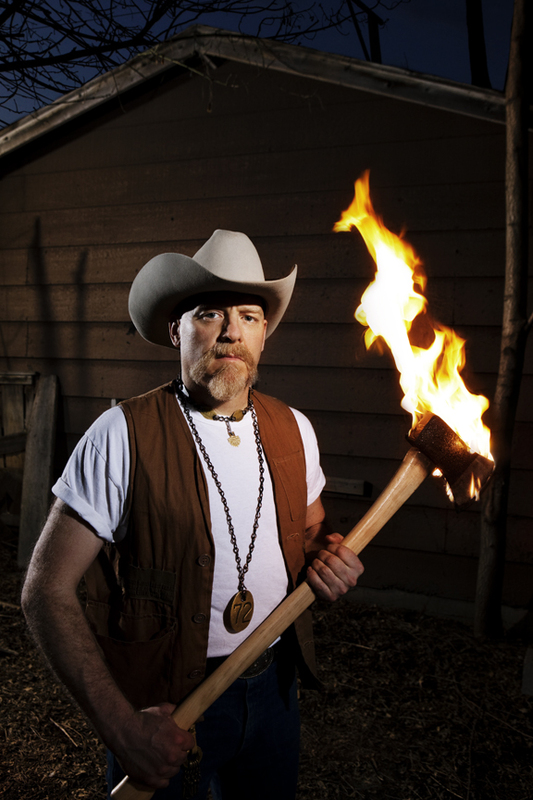 I had the chance to talk to organizer Lawrence Peters about the festival. Q - Great talking to you again. Of course, this is the 10th year of A Day in the Country. What does it mean to you that the festival is celebrating its 10th anniversary this year? Are you surprised the festival has made it to 10 years? It’s cool, man! I’m excited and honored that this grassroots event has managed to come this far, mostly through word-of-mouth. Q - What do you think of this year's lineup? How did you go about choosing the bands for this year's festival? I’ve been proud of every year’s lineup, but I’m extra stoked about this one. Jim Lauderdale is a long-time favorite of mine, and it’s going to be incredible seeing him on the Hideout stage, as part of my festival. He’s an ace songwriter and singer, and a helluva showman. I’m not always impressed by the Grammys, but that guy has earned both of his. I usually start the year with some new local favorites in mind, and a headliner wish list. I put the word out from there, and see which headliners are an actual possibility, when the smoke clears. After I have my star attractions, I balance out the lineup to include what I think is the right mix of honky tonk, bluegrass, string bands, and so on. Q - What was your idea for creating A Day in the Country in the first place and has it lived up to your expectations? I started the festival with the intention of giving the Chicago country music scene an event that we could call our own. It seemed that we were being under-represented in the bigger festivals, so starting a country-centric event was my solution to that. Folks are already asking to be part of next year’s line-up, and that is a good sign that the event is achieving the goal of supporting the local country scene. Q - Your band is again part of the lineup. What is the band up to these days? Are you working on new songs? Yes sir, I always include The Lawrence Peters Outfit in the lineup. As much as I enjoy watching my favorite bands playing my favorite kind of music, I like singing and playing, even more. It’s a highlight of my year. The band has been busy! We recently won our second Chicago Music Award, in the Best Country And Western Entertainer category, and we are nominated for the Reader’s Best Of Chicago Poll, also in the country band division (please vote for us!). We’ve also been getting some solid shows. We opened for Wanda Jackson (a career highpoint! ), and we have a bunch of cool events on the calendar ( Summer Dance on July 9, Navy Pier on Aug. 6, the season's last Picnics On The Porch, on Aug. 25, at the Hideout, and a bunch of other rad stuff). It’s being a good year for us. We also recently tracked eleven songs, and are in solid shape for a spring 2018 release. We’ll do vinyl, CD, song books… the whole shebang. All of the songs are originals that I finished since our first record, and I’m very excited about the recording. Gonna be a good one! Q - Where do you see A Day in the Country going in the future? What are your goals for the festival? I’m hoping I can keep walking that fine line between a small, friendly event, and a festival that can afford to give the local musicians a great day, and a solid paycheck, while bringing the great touring acts I want. I have an ongoing list of folks who are making the kind of country music I like, and I’ll be contacting many of them for next year’s event. It feels real good to know that there is excitement and anticipation for this yearly event. Chicago singer Shemekia Copeland provided many captivating moments at Blues on the Fox festival. 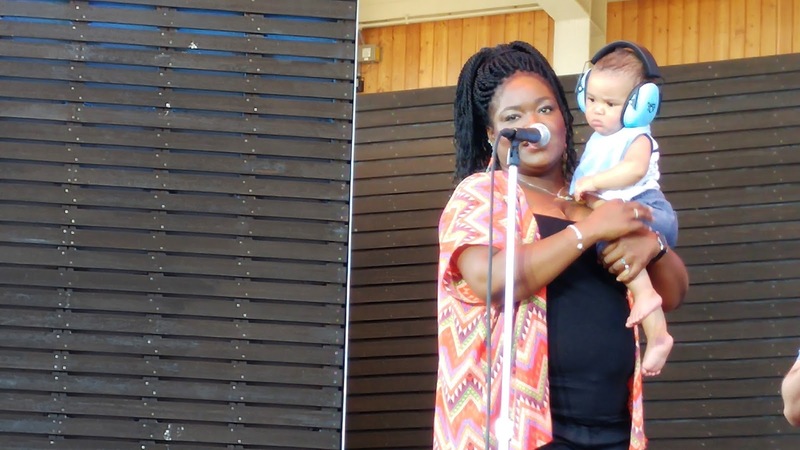 Shemekia Copeland shows off her son at Blues on the Fox festival. Despite some weather hiccups, the 21st annual Blues on the Fox festival in Aurora on June 16 and 17 provided many lasting memories. The weekend started off on a soaring note with two goddesses of the Chicago music scene - blues belter Shemekia Copeland and the legendary Mavis Staples. 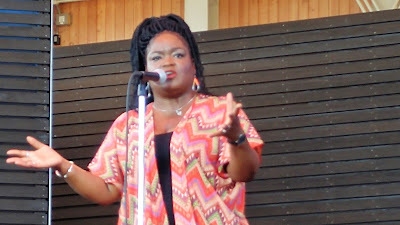 Copeland is rightly called the Queen of the Blues these days, although she rejects the title, arguing that it should stay with the late Koko Taylor. Although she took the stage with a cold, she shook it off in commanding fashion, tearing through songs such as "Pie in the Sky" along with delivering a passionate version of her father Johnny Copeland's signature song, "Ghetto Child." The legendary Mavis Staples performed with a joyful exuberance that lifted the crowd at Blues on the Fox. As fiery as her performance was, it couldn't match the one delivered by Staples, whose energy belies the fact that she is about to turn 78. 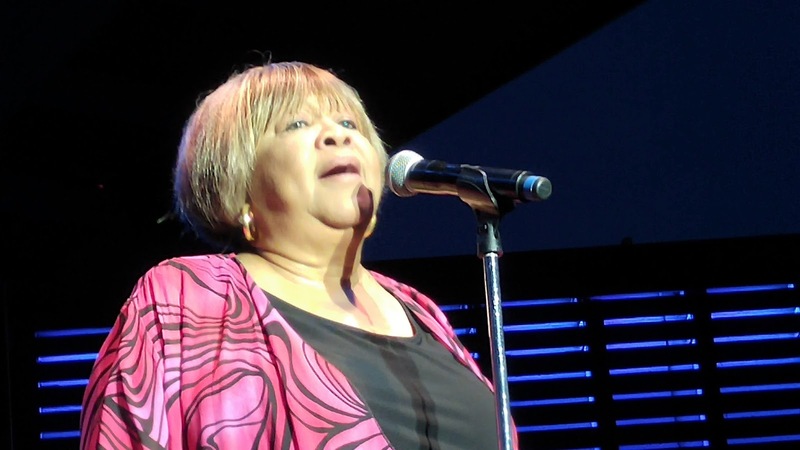 She brought fresh energy to The Staples Singers' classics like "Respect Yourself" and "I'll Take You There" along with conveying a joyful exuberance that lifted the crowd. Chicago musicians again ruled the day during the second day of Blues on the Fox as Guy King brought his soulful blues to the stage, provided some electrifying guitar licks alongside his band's tight horn section. Unfortunately, an approaching storm cut Elvin Bishop's set short, but Bishop and his band made the most of their abbreviated time on stage. Bishop also has a Chicago connection as he was schooled in the Chicago blues while attending the University of Chicago. 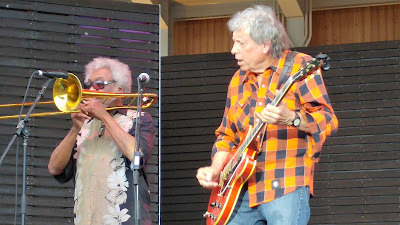 Rock and Roll Hall of Fame guitarist/songwriter Elvin Bishop performed on the second day of Blues on the Fox. Bishop and his band played with the looseness of a group of people just hanging out to jam together. Because of their limited time on stage, they could only choose a few crowd favorites, such as the song "Got To Be New Orleans" and his hit single "Fooled Around and Fell in Love," brought to new life by the uplifting vocals of Willy Jordan. Blues on the Fox has become a cultural treasure in the Chicagoland area. And hopefully those who came out to this year's festival treasured the musical gifts that were provided. One probably wouldn't think that someone born and raised in a small rural town in Israel would be schooled in the blues. 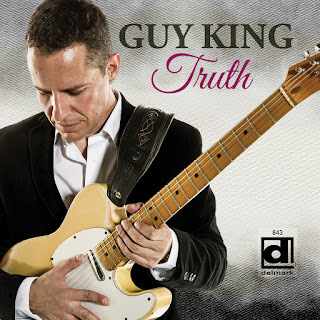 Guy King has been a growing force on the Chicago blues scene. He served as the lead guitarist and band leader in Willie Kent’s band for six years, until Kent’s passing in 2006 and then started a solo career. King will perform as part of the Blues on the Fox festival on June 16 and 17 at RiverEdge Park, 360 N. Broadway, Aurora. Gates open at 6 p.m. At 7 p.m. June 16, three-time Grammy nominee and international blues favorite Shemekia Copeland will take the stage, followed by Chicago’s own living legend, Mavis Staples, at 9 p.m.
Gates open at 2 p.m. for the second day of Blues on the Fox on June 17. "The Voice" veteran Nicholas David will take the stage at 3 p.m. He replaces Devon Allman, who has stepped away from touring in the wake of the passing of his father Gregg Allman. King will perform at 5 p.m., followed by Blues Hall of Famer, Rock and Roll Hall of Famer and Grammy nominee Elvin Bishop at 7 p.m. and Jonny Lang at 9 p.m.
RiverEdge’s satellite box office, the Paramount Theatre, 23 E. Galena Blvd., Aurora, 10 a.m. to 6 p.m., Mondays through Saturdays. sales, beginning at noon. All tickets are general admission. Ticket fees are not included. I had the chance to talk to King about the upcoming show. Q - You are part of the bill at Blues on the Fox. As far as playing at a festival versus playing in a club, which do you prefer? Or do you like both experiences? I like both, I have to admit. I think everyone that came up playing the regular way, the normal way or the old school way, played more in clubs in the beginning. It's a great intimate feeling, [compared] to when you play a larger venue, like a theater or a hall or an outdoor stage. It's a different type of feeling, but I try to convey that intimacy that I experience playing at clubs with a larger outdoor audience. Q - You do kind of have an unusual back story. You came from Israel, so do people ask you about your background and how you fell into the blues? Yes, I get that asked a lot. I understand that it's not traditional, that it's a different story than your common one. I understand that. I respect that. I was exposed to a lot of things on the radio. I remember hearing Michael Jackson and David Bowie. I was playing clarinet at a very young age, so I was exposed to classical music and big band. And I picked up the guitar mostly by ear when I was 13 years old. Through my brother, I was exposed to musicians like Eric Clapton, which lead me to Stevie Ray Vaughan. In Israel, it was very difficult to get a blues album back then. Like when I came here, I feel very fortunate that I was able to go to a store and pick up a T-Bone Walker album. Q - Are the blues catching on in Israel? I don't know. I don't know. The truth is, I haven't performed there much. I came here at a younger age. I think there's more exposure now to the blues, and more knowledge than when I was growing up there. It's not to the point where it's being played nightly in the club. Q - It's been a good year for you. Your latest album, "Truth," which was released in February 2016, is getting rave reviews, and was nominated for a 2017 Blues Music Award in the category of "best emerging artist album." You've been around for a while. Does it feel strange to be called an emerging artist? A few people have asked me the same thing. But I understand how it goes. Sometimes the definition of emerging artist is not like this new artist. Maybe I was not traveling stateside that much, even when I was playing with Willie Kent. We were really performing a lot more in Chicago, and doing a few hit and run shows elsewhere in the United States. Most of our travel was overseas, so I understand why I went unnoticed maybe a little bit. But I was very glad to receive this nomination. It's great to know that the album "Truth" did very well. I'm still performing material from it, and I'm looking forward to performing it at Blues on the Fox as well. It was a great year, and I'm looking forward to hopefully an even better one. Q - What were your goals for "Truth" and do you think you accomplished them? I think we achieved what I wanted to do. Really, the goal was pretty simple - to stay focused around the feeling of the music and the way I sound and feel it right now. Right now, meaning when we recorded it. I think the album reflects who I was then. So I was able to get my message across. Most of the things I had done before were for my own independent label, and "Truth" was done for Delmark, so I hoped that we'd get more notoriety and more people noticing what I do, which it did, so we achieved that. I kind of wanted them to know some of what I do, kind of like, 'Hello, I'm Guy King.' It's like a business card. Q - Of course, "Truth" was your first album for Chicago's Delmark Records. Are you pleased that it made such an impact, seeing it was your first album for Delmark? Yeah, very much, very much. I'm very glad of that. I was happy with the sonic quality of it. And then when people started responding to it, then of course I was happy about it. Q - I've had the pleasure of interviewing Sarah Marie Young and I was wondering how you hooked up with her for the duet on "Truth." Sarah is now my wife and the mother of our firstborn. We got married April 2, so it's fresh. Even before that, we were already spending time together. I knew that Sarah was a wonderful vocalist and a great singer. We talked, and she said she would love to sing background with my background singers on the album. And then I asked Sarah what she would think about doing a duet, to kind of break up [the album] a little bit and add a female voice. She said it would be a pleasure and an honor. We were looking for a number, and I wrote this tune - "My Happiness" - originally for me to sing. We tried, at first with an acoustic guitar, just her and I, and it sounded great. I came up with the arrangements for the horns, and it was quick and natural. Q - So are you guys going to collaborate more, now that you are married? Time will tell. We will probably, but there's no date as far as an album or any duet or any performance yet, but we do enjoy each other's work a lot and do enjoy performing together. No promises, but I think I speak for the both of us when I say we would love to do more together. Q - A person can't call you a strict blues player, because you kind of weave in and out of blues and jazz and big band as well. But it seems like you are comfortable in all those genres and it seems like you are trying to bring all those genres together. The way I look at music is maybe a little bit different than as you say, "purists." When I play the blues, I think I play as bluesy as anybody who plays blues. My influences are probably some of the most wonderful blues players that ever lived - I'm talking about B.B. King, Albert King, Robert Johnson, Lightnin' Hopkins, T-Bone Walker or many others that I can name. I listen to a lot of them and I appreciate and admire a lot of their work. Being self-taught mostly, I call them my teachers. But I also understood early on that the feeling of the music is what makes music great. That feeling can be a part of what people call jazz, or a ballad, or standards or rhythm and blues. I'm always going to play bluesy because I believe in it. 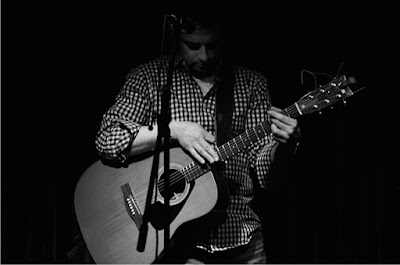 It's a deep feeling, and I try to bring it to everything I sing or play. This is my goal. Q - Of course, you were Willie Kent's lead guitarist and band leader for six years. As far as what you learned from him, what were the big lessons that he taught you? He taught me a lot of stuff. We were playing a lot of blues, what people would call blues, but even Willie would throw in a rhythm and blues number, a soul number or some ballad. He taught me that the feeling of the music is what gets the message across. I saw that on a nightly basis. He delivered. He sang with conviction and meant what he said and said what he meant on stage on a nightly basis. I had to play my best behind him to try to keep up. I would like to think that I'm giving my listeners and my fans the same piece of my heart and my feelings when I perform. On its latest EP, "The Arbor Sessions," Chicago band bluefront takes listeners on an emotional ride. bluefront will perform at 11:30 a.m. June 10 at the Old Town Art Fair at the Old Town Triangle Association Building, 1763 N. Park Ave., Chicago. More information is available at www.oldtownartfair.org. Q - Is there a meaning behind the band's name? How did the band come together? What do you think each member brings to the table? Yes. bluefront comes from this store in Ann Arbor Michigan that basically sold doritos, snickers bars, toothpaste and kegs of beer. Many, many kegs of beer. When I was thinking of a band name, my sister told me to think about a great time in my life and asked me to remind her what street my friends and I lived on in college. Arbor Street didn’t seem like a good idea, to say the least, but then I thought of the Blue Front. No one knew where Arbor Street was, but everyone knew where we lived when we would say - two doors down from the Blue Front. So I just made it one word, all lowercase and here we are. I met Jason Steele probably 12 years ago when looking for a new jazz/theory teacher. As I started writing and performing, I was set to open for one of his bands when he asked if I wanted him to play on a few tunes. He did, we loved how it sounded and then it just kept going from there. We met Nick Kabat through the same person who introduced me to Jason. We should really name the band after our mutual friend. Jason and Nick are amazing musicians. They bring everything that fills in the spaces of the songs and make them into something I could never have imagined. Listening to them is my favorite part of playing together. 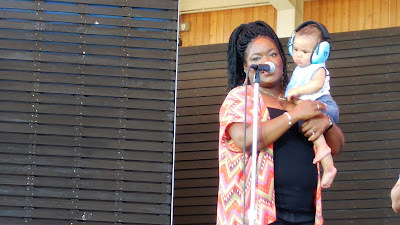 Q - How do you juggle being a musician with running your family business, Audio Consultants? I know the business started in 1967. Did being around the business influence your decision at all to get into the music business? I guess I just do what I have to do to get things done, nothing conscious really. Music is important to my parents and they made sure we had a music education/lessons, even when my sister and I were not that interested. Being around the business taught me about listening to music and since music was always around our house, in some form or another, probably had something to do with it. Q - You previously were a corporate finance lawyer. How did you transition into being a musician? Are you glad that you made the switch? I always felt I should be writing and playing music, even when pulling all nighters trying to close deals, so it was always there. Very glad to have left that behind. Q - What do you think of the Chicago music scene and how do you see yourself fitting into it? I like that I have met people I never would have met in my old life. Not only that, but there seems to be, for the most part, a true feeling of support and camaraderie. I just hope I do my part in that. Q - What does the rest of the year hold for bluefront? What are the long term goals for the band? Hopefully to get more and more interesting gigs, add a bass player and record.